Our summer exhibition will be a riot of colour, showing how St Ives became home to a group of artists who took painting to dizzying new heights of vivid expression. For a short period in the 1950s, this small Cornish fishing town in the far south-west of England challenged both Paris and New York for the international modern art crown. The show will concentrate on five ‘middle generation’ (or, more accurately, second generation) St Ives artists who used light, space and colour to create dazzling paintings of huge power and presence. The first of these, Peter Lanyon, was the only true Cornishman by birth among his contemporaries. In the 1950s his painting became freer and looser, losing its direct geographical associations and becoming vertiginous in its exploration of air and space, reflected in the artist’s passion for gliding which ultimately led to his death in 1964. Patrick Heron, a critic as well as a painter and an articulate spokesman for abstract art, also demonstrated a new sense of freedom inspired by his move to Eagle’s Nest, a house perched above the Zennor cliffs. The often very large canvases that resulted, such as Tate’s massive Horizontal Stripe Painting: November 1957-January 1958, pulsate with pure colours that dance and vibrate next to one another, marking a new phase in Heron’s career. Roger Hilton was the most travelled of the artists and his seemingly effortless and spontaneous paintings combine loose lines and shapes that reference recognisable forms and figures – what the artist termed ‘allusive abstraction’. Hilton’s good friend, Terry Frost, similarly used forms inspired by the landscape – both that of St Ives and Yorkshire – to create immensely satisfying compositions whose sense of space and harmony he continued to refine throughout his career. The last artist featured, Bryan Wynter, started the 1950s painting harbour scenes and local landscapes but by the end of the decade was creating dark, absorbing compositions that draw the viewer into their brooding world – a long way from the sunny seascapes that are often thought to characterise the painting from St Ives. The period of painting explored in the exhibition is particularly pertinent for Abbot Hall: the gallery underwent renovation in the 1950s before opening its doors to the public in 1962. Among the very first works acquired (for relatively little money at the time) were contemporary paintings by these St Ives artists, some of whom the gallery’s first director, Helen Kapp, knew personally. These works now form a small but extremely important part of the permanent collection (it is also worth noting that both St Ives and the Lake District share a status both as a major tourist destination and as a mecca for itinerant artists – albeit with very different results). 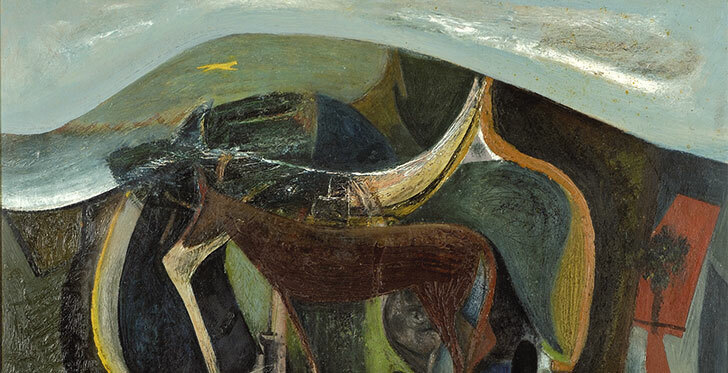 In a broader sense, St Ives continues to exert an influence as part of the history of British modernism: recent exhibitions, such as International Exchanges: Modern Art and St Ives 1915-65 (Tate St Ives 2014 and mima 2014/5), highlight the role of artists associated with St Ives within a wider, international community. It is hoped that this exhibition will strengthen further our appreciation of this most critical and explosive period in the history of modern British painting. This exhibition will include works from major British collections, such as Tate, the British Council, Manchester Art Gallery, The Fitzwilliam Museum and the Arts Council, as well as numerous private lenders, and follows very successful Abbot Hall shows devoted to key figures from the first generation of artists based in St Ives, most notably Ben Nicholson (A Continuous Line: Ben Nicholson in England, 2008) and Barbara Hepworth (Barbara Hepworth: Within the Landscape, 2014).